We’re revealing designer-approved tips so everything in your ensuite falls in the right place. An ensuite bathroom with similar tile colours on the floors and walls—even if they differ in shapes—will look modern and feel larger. ☑ Consider using affordable ceramic or porcelain tiles which mimic the look of and feel of expensive stone. ☑ If you can only lay wall tile to a certain height, paint the plaster above the tiled area in the colour similar to the tiles. 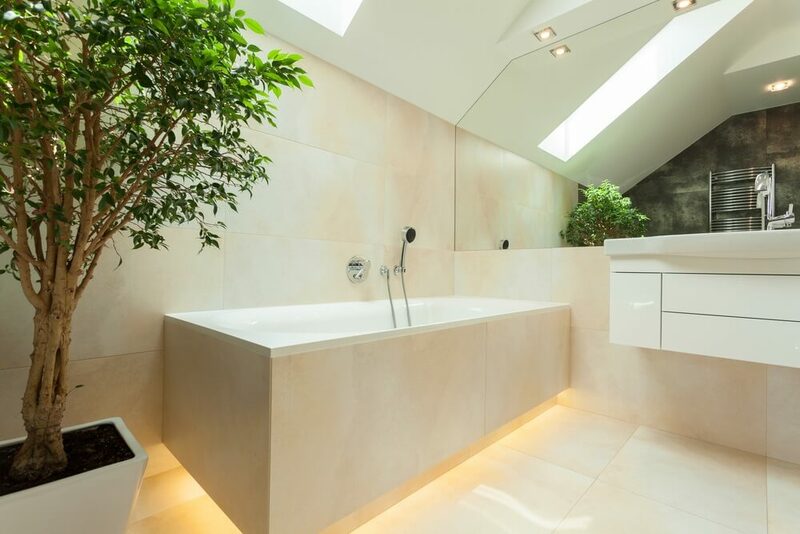 Incorporating large window walls in your design is an opportunity to bring nature in your ensuite. This will also make a small space feel larger. 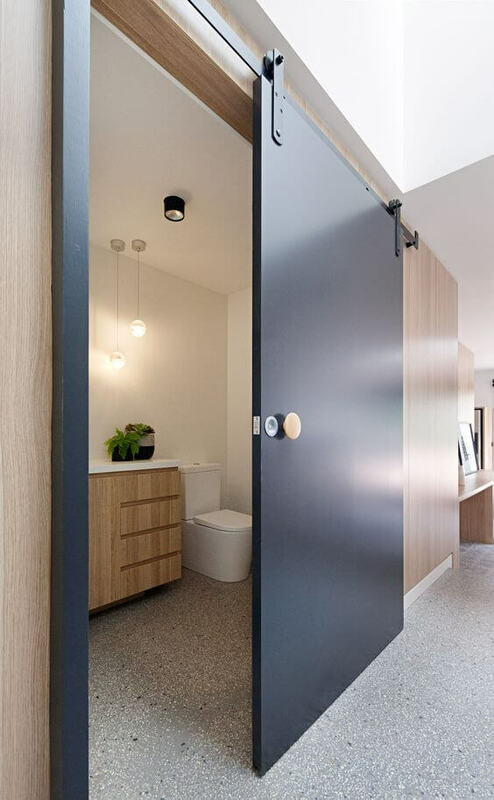 If you like, you can integrate a sliding door into the glazed walls, so you can access your outdoor space from the ensuite. 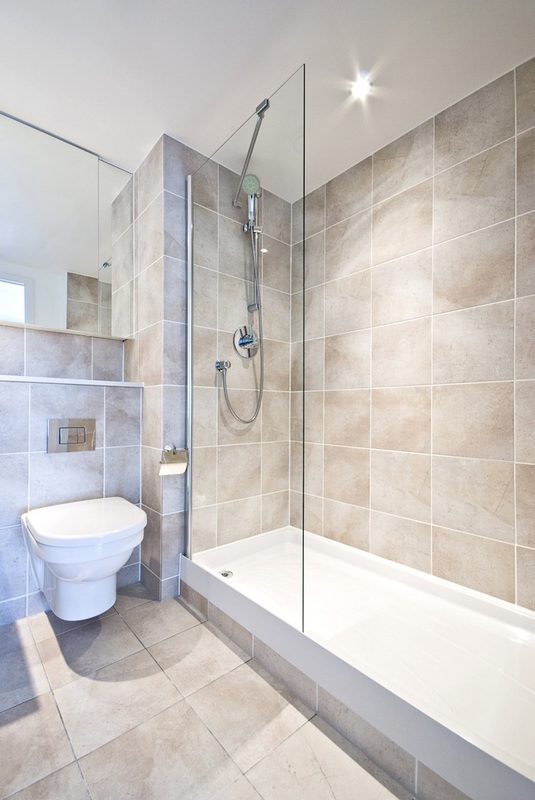 ☑ Put your ensuite on the side of the house so it’s easy to include a glazed wall into the design. Lighting is a game changer. It is the key element that makes your bathroom bigger. It also sets the mood in the space. Strategically place all your light sources, whether it’s a bulb or a window. All your artificial lighting must produce soft and diffused light or lighting that resembles daylight. Use LED lights because it consumes less electricity. ☑ Installing LED strip light under a floating vanity will highlight it. You are not limited to single-hinged doors. There are other types of doors to choose from. If you’re trying to save space, consider a sliding door. Hinged doors consume more floor space compared to a sliding one. ☑ Build a hidden pocket in the wall so you can hide your sliding doors. 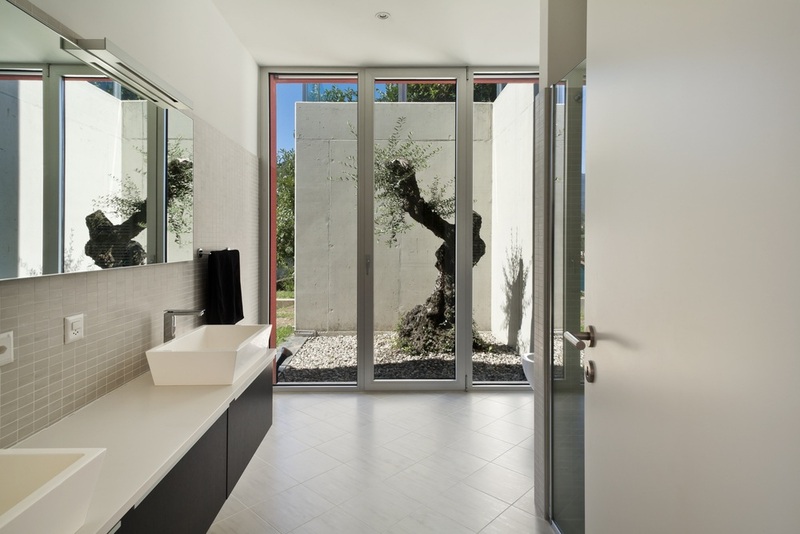 ☑ Glass sliding doors allow light from the adjacent room to enter the ensuite. Use frosted glass as it will give you a sense of privacy. 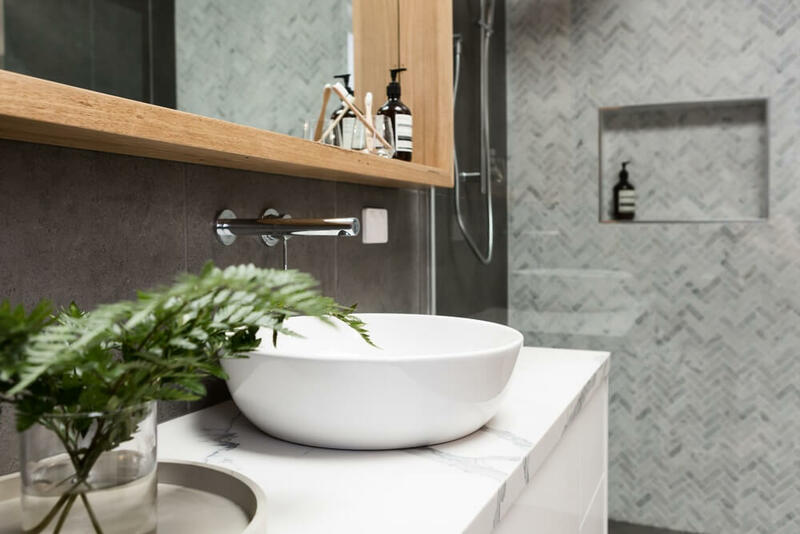 Whether you’re working with a large or compact room, you must strategically plan the location of the accessories that you need in your bathroom to make it functional. As a general rule, position the huge pieces such as the toilet, vanity, shower, and tub first. Then, you can place smaller items such as towel rack, trash bins, toilet roll holder, hand towel rings, shower controls, etc. Keep it ergonomic. For example, the rolled tissue holder must be within reach from the toilet. At the same time, the towel rack must be located beside the shower and the vanity. ☑ All your bathroom accessories must consistently follow your planned style. All finishes must be uniform to give you a seamless look. ☑ Secure all the fixing with screws to keep them from falling. 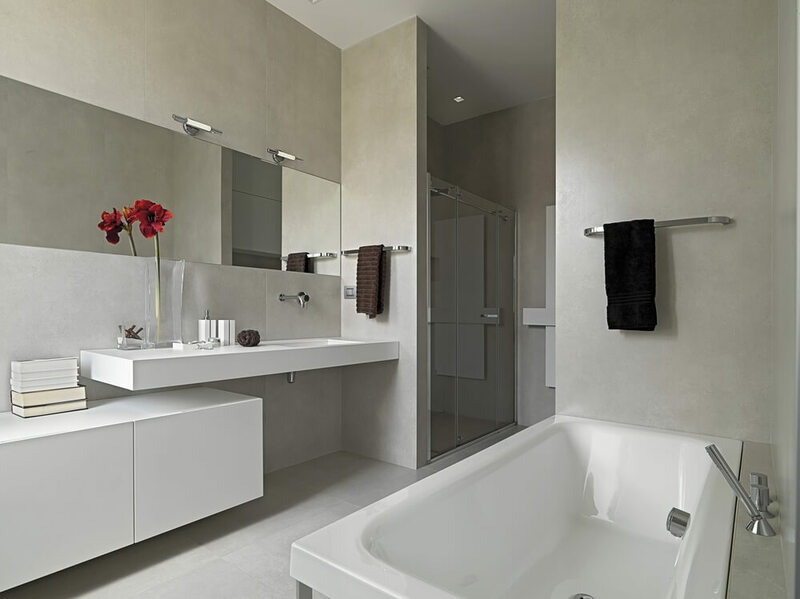 The total cost of building your ensuite bathroom depends on the scope of work. 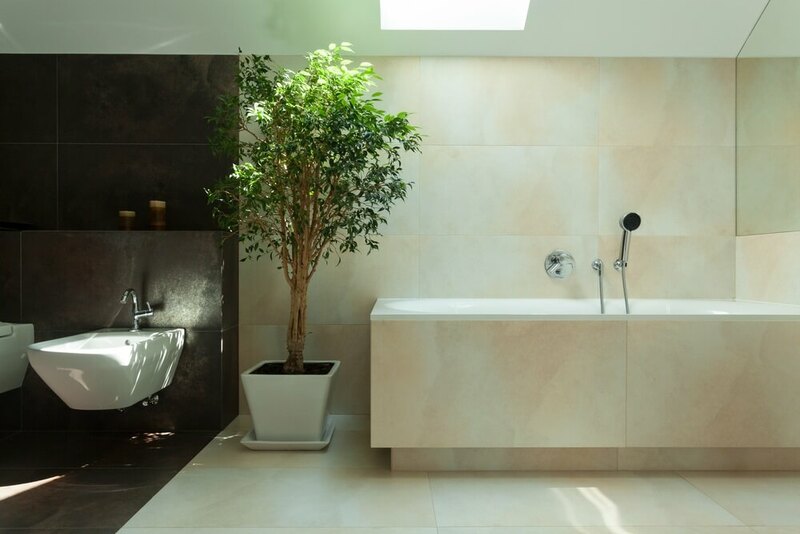 For instance, a renovation which replaces the bath fixtures and fittings but keeps the layout and plumbing of an existing bath will be cheaper than a total renovation or addition of a new ensuite. ☑ Tap into an existing plumbing system. Set all fixtures and fittings on one wall as much as possible. Each bathroom fitting and fixture has a purpose in the bathroom. Only install the items you need (right amount of it). Be smart about using your space. ☑ Find out if you need a large mirror wall to enhance your space or is a regular-sized vanity mirror enough. Installing a wall mirror costs a fortune, therefore the vanity mirror is a more practical and economical choice. ☑ Determine the kind of storage that you need. You can put floating shelves and medicine cabinets in the vanity. A floating vanity allows you to maximise the floor space for storage baskets. ☑ Decide whether your vanity basin is hung on the wall, placed on the bench, or recessed into the cabinet. ☑ Finalise your colour selections and material finishes. Follow your colour palette and theme. ☑ Declutter your ensuite bathroom every once in a while. Organise your storage and remove the items that you don’t use anymore. 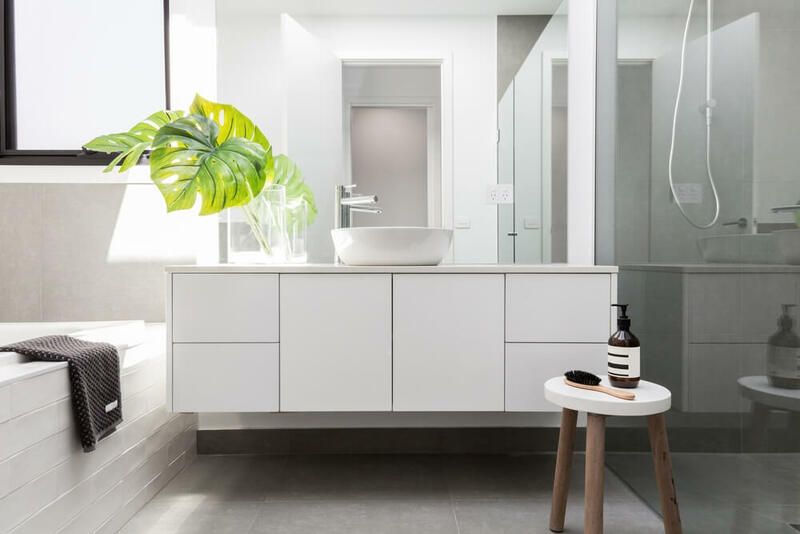 Discuss your upcoming bathroom renovation with a Melbourne-based architect/designer.